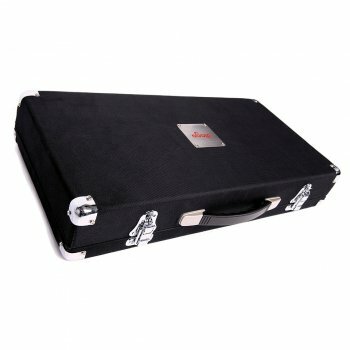 Nothing comes close to the protection a true hardcase offers. 1/2" eastern plywood and dense foam padding inside the lid keep your pedals protected from the rigors of the road - impact, scratching, dirt & moisture. We wrap our 1/2" thick eastern plywood pedalboards in an attractive and super-durable polyweave skin, to keep the board looking great for a lifetime. We fit our boards with robust catches, high-quality hinges and steel corner strengtheners, and use a through-bolted amp-style handle for a really solid feel. Each board is assembled by hand in our factory and undergoes strict quality control for consistently fantastic pedalboards. The key to great design, is simplicity. Some boards come with bells and whistles such as a power splitter box (not even a power supply because you still need a wallwart - it's just a glorified daisy chain), an effects loop, or even a built in speaker. Why anyone would need any of these things built in is completely beyond us, so Diago Pedalboards do exactly what a good pedalboard should. Nothing more, nothing less.